Will the opening date of new concert venue at The Banks be delayed ... again? The long-awaited concert venue finally got the green light in November after years of dispute over who should own it and where it should be built along the riverfront. CINCINNATI — Like many business owners at The Banks, Bob Deck has been waiting years for crews to break ground on a new concert venue here. And he could be waiting even longer for the promised music crowds unless city and county leaders can solve a dispute over parking. “There are certain times where you feel some lulls in business, where you just don’t have the crowds. And winter is one of them,” said Deck, a managing partner of Four Entertainment Group (4EG), which owns The Stretch bar near Great American Ball Park. The Bengals had originally opposed building a concert venue adjacent to Paul Brown Stadium. But the team agreed to allow the Cincinnati Symphony Orchestra to build at that location in November, as part of its new lease agreement with Hamilton County. That was supposed to clear the way for crews to break ground on a music venue scheduled to open in the spring of 2020. But city and county leaders are now fighting over who should pay for the concert venue’s parking garage. “We can’t sit by and allow for this project to stall, be delayed, be held up, or to flounder at all because of the failure of one or more individuals at the city,” said Hamilton County Commissioner Todd Portune. Portune believes the city must split the cost of the parking garage under the terms of joint agreement signed in 2007. But Mayor John Cranley doesn’t believe the city is obligated to pay for parking. “We have no legal obligation to split the cost on the garage, No. 1, and No. 2, essentially if we were to take money that could go to police and fire and put it into that garage just so that they could buy out Hilltop for the Bengals, that’s essentially taking dollars that could go to cops and firefighters and putting it into the Bengals deal,” Cranley said. As part of the new lease agreement, the county agreed to buy 15 acres of riverfront property owned by Hilltop Basic Resources, Inc. The land will be used to create as many as 1,950 parking spaces for fan tailgating. It is also a spot where the Bengals could someday build an indoor practice facility. The city is not part of that lease deal. But Cranley believes the county should have chosen to put the music venue on Lot 24, which is across the street from Taste of Belgium at The Banks. This lot already has a parking garage, “that costs no additional tax dollars from the city and the county,” Cranley said. The 330-space garage and elevated podiums that will support the concert venue are estimated to cost $29 million. The county has already secured just over $20 million for the garage from state funding and leftover money from previous phases at The Banks. The city and county still need to come to terms on how to pay for the final $8.2 million. The county has offered to advance the city’s roughly $4 million share of the parking garage. The money will be repaid from future revenues generated at The Banks, Cranley said. While the city and county have a tentative deal on the parking garage, they are still trying to negotiate the terms of the loan. She said the county is still waiting on a response from the city. How much is a gravel pit worth? 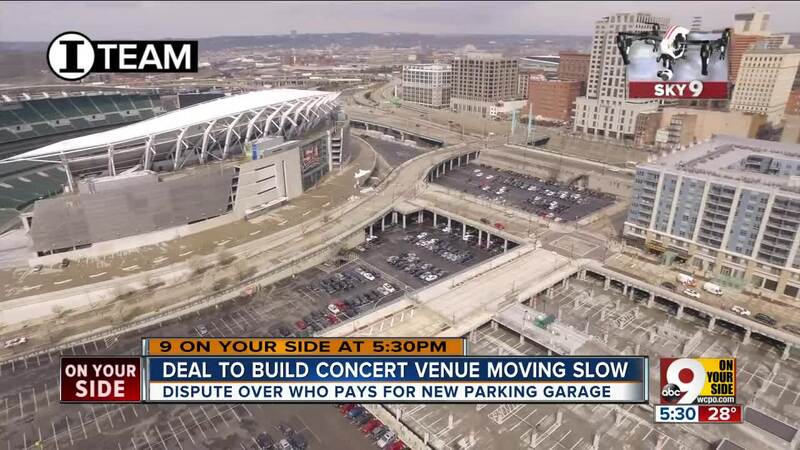 Meanwhile the county is working on another big deal that must come together before the concert venue can be built – buying new tailgating space for the Bengals. “With a viable alternative site and fair compensation we would certainly cooperate in relocating from our current site to enable the development of an exciting music venue for the enjoyment of the community, increased parking and the potential expansion of the Cincinnati Bengals practice facilities,” Kevin Sheehan, president of Hilltop Basic Resources, wrote in a statement to WCPO. The 78-year-old family business mines limestone, sand and gravel, and produces concrete. “Hilltop looks forward to continued substantive discussions with Hamilton County. It is our hope than an agreement can be reached in a timely manner so that all parties can move forward with these changes,” Sheehan wrote. County officials have been in talks with Hilltop long before they signed the new lease with the Bengals in November, Portune said. “It’s been no secret that that land is likely to be a part of the overall Banks redevelopment,” Banks said. But Portune declined to say how much the county would pay for the Hilltop land. “One of the things that, by Ohio law, you’re allowed to discuss in private is land acquisition,” Portune said. That worries economist Jeff Capell, who is founder of the local group, No More Stadium Taxes. WCPO conducted a search of riverfront land owned by Hilltop companies on Hamilton County’s auditor website. It showed that just over 12 acres of Hilltop land had been appraised at $4.7 million. But that’s not necessarily fair market value of the land. “I cannot begin to imagine how you would ‘put an independent price tag’ on the parcel in question without doing a full fee appraisal,” Rhodes said. Former Cincinnati City Councilman Kevin Flynn, who is a real estate attorney, said the county is not allowed to pay more than fair market value for the land. Ohio law also entitles Hilltop to relocation expenses, actual direct losses from moving and reasonable expenses to reestablish their business. County leaders have valued property at The Banks at $4 million an acre – which would put the value of 15 acres of Hilltop land at $60 million. But Flynn said land at The Banks is much more valuable than Hilltop land because it has been built up out of the floodplain. “That property east of Paul Brown Stadium, that is way different than property west of Paul Brown Stadium,” Flynn said. Whatever the price of the Hilltop land, county officials still emphasize the good deal that taxpayers won from the new lease agreement with the Bengals. It puts an end to the county’s projected $29.4 million out-year payments to the Bengals. And it places a $42.3 million cap on repairs and enhancements that the county must make to Paul Brown Stadium through 2026. Without that cap on stadium renovation spending, Portune said the county could have been on the hook for $100 million or more. Meanwhile, as negotiations continue, county leaders are worried the concert venue may not open next spring.